Do you find yourself changing your skincare routine during the winter months? Do you question whether you’ve spent enough time on self-care by the end of the year? Do you wonder how you can combine the two without sacrificing time for other things that are important? If you answered yes to any of the above questions, our solution to you would be our client Geneva Naturals! Geneva Naturals creates natural skincare products using only the highest formulation standards and all of our products are 100% made in the USA. The company was created with the belief that self-care shouldn’t be limited to vacations. We created Geneva Naturals for the woman who never takes a break — whether that be in motherhood, her career, or anything that she endeavors. We became aware that as a consequence of you changing the world, sleepless nights and long days can take a toll on your skin. This could mean a dull complexion, tired eyes, and premature signs of aging. We empathize with this problem deeply. More often than not, we put ourselves second to move our passions in life forward. And while our life’s dedications are what make for the most beautiful moments, we disregard self-care as a form of self-respect. With the same fire underneath us that we’ve seen in the women that inspire us, we created Geneva Naturals to take you away on an overdue vacation, without having to take any of your time. Geneva Naturals makes it easy to treat yourself! We love that they’ve taken into account that their customers are already busy with their range of harmless products. New skin care and beauty companies are conveniently at our fingertips, which makes it hard to select the right one for your needs. In a recent campaign, we selected an amazing group of busy bloggers to work with Geneva Naturals who’ve since blogged about their experience. Ria Michelle enjoyed herself at the Geneva Naturals blogger’s brunch in Miami. She was impressed with their serums. “I’m really into serums at the moment in my skincare journey. I got super excited to try theirs and immediately rubbed some on my arm to test. Their serum features 20% Vitamin C and Edelweiss. Edelweiss is a special anti-aging plant that grows in the Swiss Alps. The serum helps with firmness and lines and wrinkles. So I’m sold.” Check out her beautiful photos of the event here. Talk about the right place at the right time! Z had been looking for harmless skincare when the blogger’s brunch rolled into town. Here’s her favorite product so far: “Between traveling often and spending most of my time outside in the heat it’s no secret that my skin has been needing some extra TLC for quite some time. I’ve been using the Advance Vitamin C+E serum along with the Advanced Anti-Aging Moisturizer Cream with SPF and I can’t tell you enough how much I love these products. Just four days after using the new line both in the morning and at night before bed, I noticed that my skin (especially around my eyes) started to feel a bit more firm.” Read more. Tiffany Gonzalez named her favorite product! “So far my favorite of the bunch has been the Vitamin C+E Oil. It smells so good and goes on the skin smoothly without leaving any type of residue behind. I see my skin brighter and more hydrated after using it for a week! Must try if you ask me.” Read more. Claudia, a 30-year-old beauty feels like she started on her skincare journey too late. We can totally relate. Here’s what she started doing after the brunch, “I‘ve been trying to give my face as much TLC as I can and I can’t think of a better way than with natural products. I have been using the Advanced Vitamin C+ E Serum every night this week followed by the Advanced Anti-Aging RetinolCream. I only use them at night before I go to sleep for now, and I am so happy with the results so far! Seriously I started feeling the results right away. Oh, and another plus, the products smell amazing!” Read more. Busy, short on time and on-the-go career women and mothers (and men) now have an ally in the skincare and self-care departments! 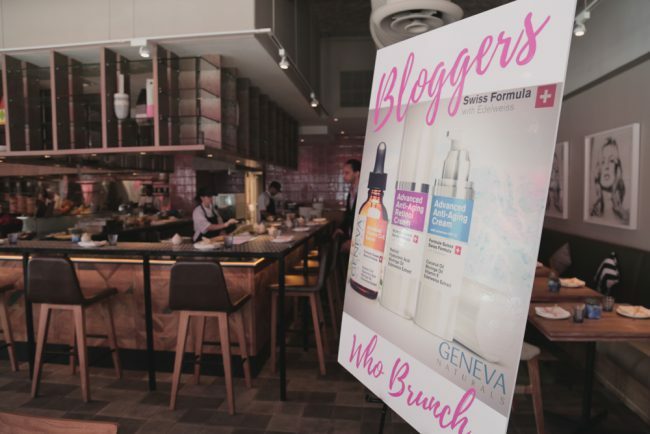 We’re thankful to have partnered with Geneva Naturals and these amazing bloggers for the #BloggersWhoBrunch event in Miami. Now that you’ve heard rave reviews about Geneva Naturals, take a moment to shop their collection of fine products here. Will you try these Geneva Naturals?